I have absolutely no recollection of this recipe from my childhood. 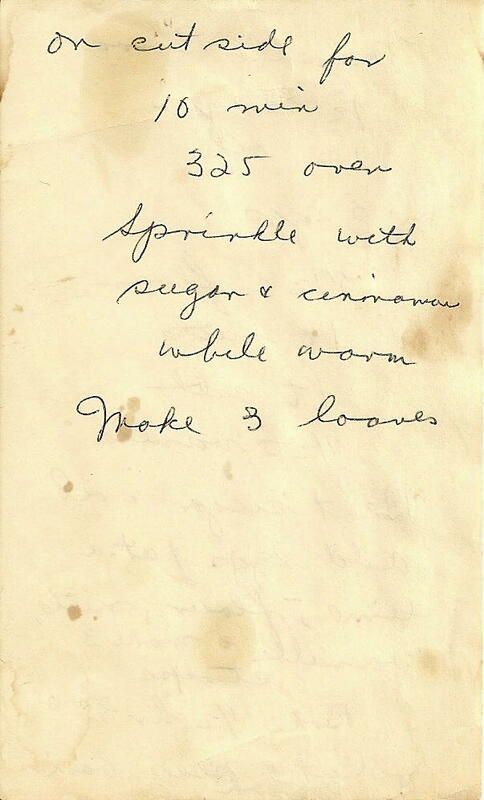 As part of my grandmother Jessie’s recently discovered files, “mandlebread” is a fantastic recipe. Either I had never eaten this cookie or simply cannot remember it. For a child, perhaps it is too hard as cookies go? Mandlebrot does not go as well with milk, say, rather than with tea – ugh for most kids – or coffee – double ugh. It is also devoid of chocolate, so I might not have cared for them, obliterating the memories of one try from my mind. The recipe is very specific with its directions and was a breeze to follow – with one odd exception: “nuts”. “Mandel” is “almond”, so I suspect Jessie just knew to use them – rather than other favourites of hers, such as pecans or walnuts. 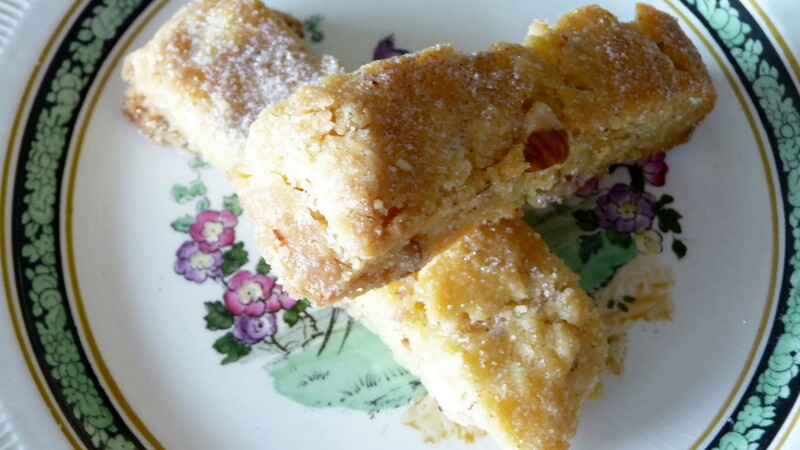 A mandelbrot, or, mandelbrodt, is an middle-European counterpart to biscotti, made typically with almonds (“mandel”, in both German and Yiddish, “brot” meaning “bread”). Mandelbrot has made a bit of a comeback in cookie-dom, along with the resurgence in world-wide coffee-culture (in this iteration, think Starbucks and free WiFi as opposed to Le Procope in Paris and “philosophers cafes”). 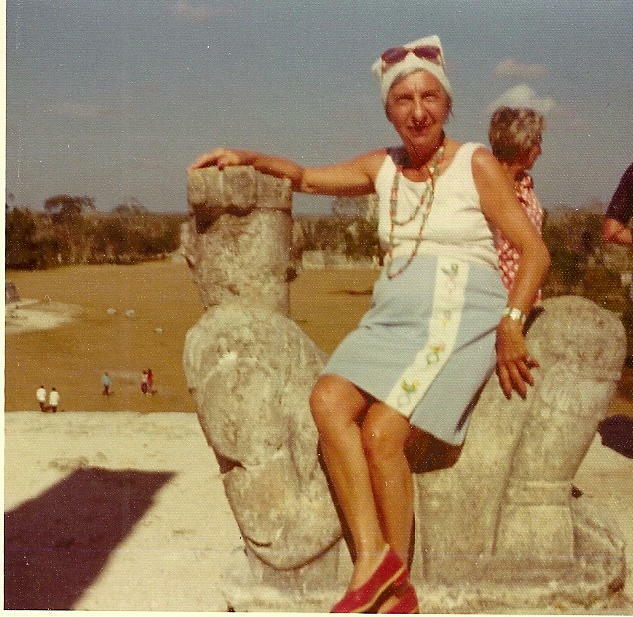 Around age 70, Jessie enjoyed the Mayan ruins in Mexico. What I found amusing about this recipe is that I could not find a photo which somehow would correspond. So I chose one of my grandmother at the ruins of Uxmal on a winter getaway to Mexico around 1974. Jessie visited Israel right after Egypt a few years before her trip to Mexico (and I have used the one photo I have from that tour already) but never went to middle-European destinations (e.g., Austria, Hungary, or Germany, where mandelbrot once reigned supreme), so the Mayan setting will have to do! I enjoyed following Jessie’s recipe and making this fine cookie. As I had never made either biscotti or mandlebrot before, I expected it to be more time-consuming or even finnicky. However, this recipe turned out to be fast to prepare and very straight forward. The cookies turned out to be substantial, with enough heft to hold up when dipped in hot coffee or tea (espresso, cappuccino, or vin santo would work as accompaniments, too). The almonds provide a crunchy textural counterpart to a tight but not rock-hard crumb; I feared these might turn out like the not-so-stellar biscotti (why not call them what they are: inferior and stale) one finds in many coffee houses these days. Yet I do believe that mandelbrot is generally not quite as hard as good authentic biscotti. With the dusting of cinnamon-sugar all over the cookies, there is a burst of flavour and an additional crystalline crunch. This definitely is one of my favourites of Jessie’s recipes I have prepared to-date. 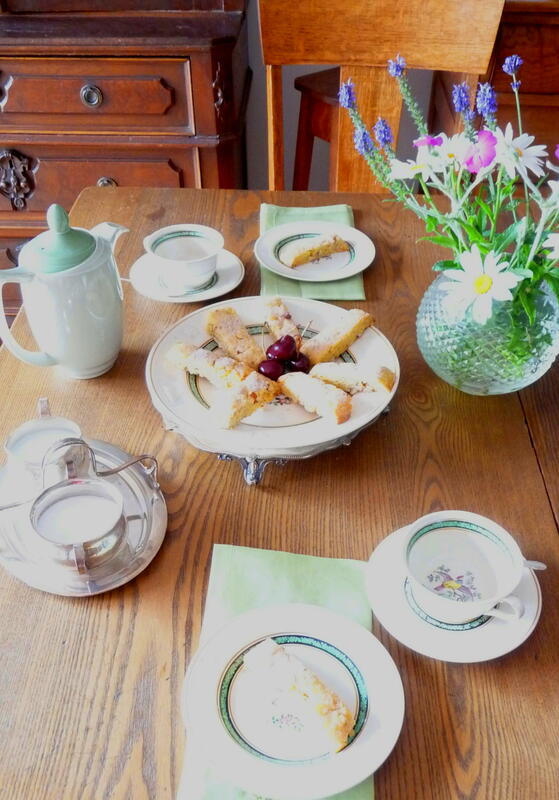 Perfect for afternoon tea or coffee, Jessie's mandelbread is on her wedding china here. While I had not considered this during the baking, the mandelbrot would be even better dipped half-way into dark chocolate, maybe with a touch of cayenne. Oh, that must be the connection to Mexico I was seeking above! Whatever you call this cookie, Jessie’s “mandlebread” is a toothsome treat. 1. Pre-heat oven to 350 F. Line cookie sheet with non-stick silicone pad or parchment paper. 2. Beat eggs, one at a time, into oil, until well blended. Stir in vanilla. 3. Mix flour, sugar, salt, and almonds together. 4. Mix egg mixture into flour. 5. Turn out onto work surface, kneading just a bit. 6. Form three logs or “strips” of about 10″ by 3″. Round off the edges a bit. 8. Remove baking sheet from oven. Slice, with a sharp knife, into 10 segments of approximately one-inch each. Place segments back on sheet on the cut side preferably. 9. Bake at 325 for 10 to 15 minutes, or until a light golden-brown. 10. Sprinkle with cinnamon-sugar mixture when just out of the oven. 12. Enjoy with whatever drink makes you think of the times when coffee, cookies, and conversation were an important feature of the day. This entry was posted in Baking, Cookies, Dessert, What Would Jessie Dish and tagged Baking, Chewy, Cookie, crunchy, Holiday, Old-Fashioned Cuisine, Recipe, Vintage Recipes, WWJD. Bookmark the permalink. Interesting. I posted mine last week and these look quite different. I’d love to do a taste test. Another hit from Jessie. 🙂 I still need to give last week’s pancakes a shot! If our weather ever cools down, I’ll fire up the oven for these…I’ve made biscotti before, so mandelbrot shouldn’t be a problem! I have these in the oven right now for the second baking, and have already sampled a bit (I cut the rounded ends off to make more even pieces, and have been snacking on those)–Jessie’s mandelbrot is DELICIOUS! Better than the biscotti I’ve made before. Thanks for sharing all these recipes with us. The cookies look delicious, but her wedding china really caught my attention! It’s beautiful — do you happen to know the pattern? Hi, Theresa. You’re very sweet! 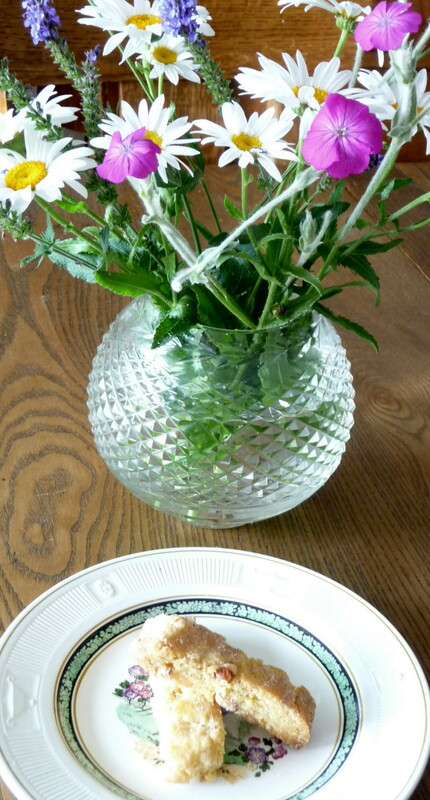 The china is by a small Stoke-on-Trent pottery, bought up by Wedgwood in the early 20th century, called Crescent-Ivory. I have been looking for it literally for decades, and it is almost impossible to find anywhere. However, I will check more in England this fall. What an absolute wonderful story and recipe!! I love these.. I love hearing about Jessie’s world travels–she sounds like an adventurous lady. 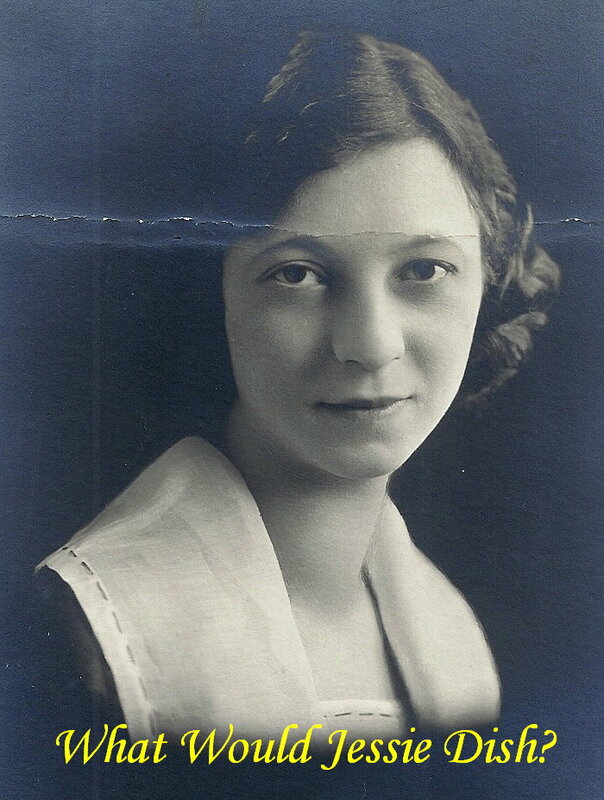 My own grandmother, Margot, took her kids on vacation to communist Yugoslavia in 1969..spunky, right? I bet they would’ve gotten along! Hi, Maddie. 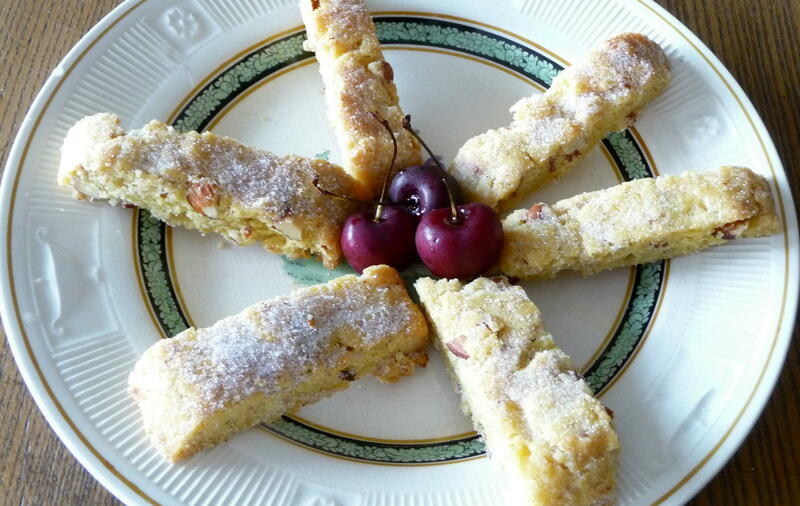 I bet you’ll like mandelbrot better than biscotti…just a hunch. Yes, I imagine Margot and Jessie could have had a fun time together, especially if Margot liked baking and inducing guilt as much as travel! 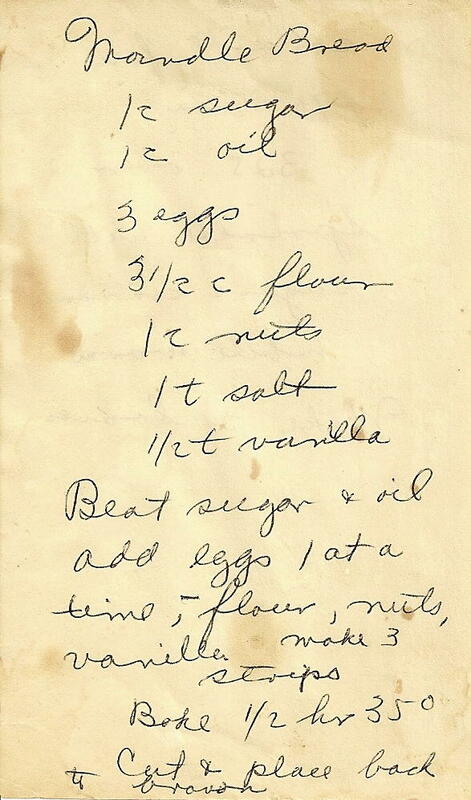 This makes me beg my grandma to give me her recipe book. The pictures of the old paper with handwritten food notes struck the romantic cord in me. Looks very tasty! Mhm, Dan! I like! It’s hard to find a good dunker, y’know? These look like they’d be perfect. And with the addition of chocolate and spice – that sounds like it would be super mega awesome. Gosh, I love Jessie. You do realise that I’m going to steal all of Jessie’s recipes and then get really, really fat, right? Hi, Jax. I think you’ll like the mandelbrot but, in time, learn how to control the wacky feeding frenzy….funny how Jessie had so many dessert recipes! Chocolate dipped sounds like the perfect addition. I wish I could just steal one off that beautiful plate of hers. I would love one to go with my coffee right now. Yum. I will try this soon. Mandel in Swedish is also Almond, and Almondbread is Mandelbröd, so almost the same. I love reading your Jessie stories! !